Judy Chicago began The Dinner Party alone. After months of work, her concept had evolved to the stage where it required the assistance of other people. 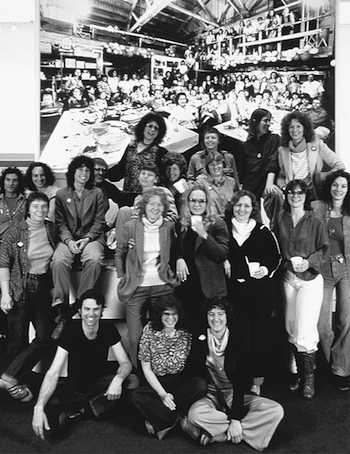 Gradually, a studio team was built, and over the course of the next few years, hundreds of volunteers helped the core staff of The Dinner Party studio to realize Chicago's vision. They brought a variety of skills to the project including ceramics, needlework, fabrication, graphics, photography, and research, and worked together under Chicago's guidance to complete the piece. The three mural-sized (94 3/4 x 48 1/4 x 1” each) Acknowledgement Panels are a visual record crediting the collaborators for their commitment. 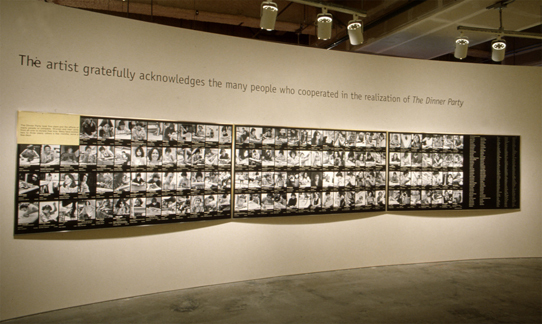 The Acknowledgment Panels depict the 129 members of the creative and administrative team with black-and-white photographs. Included in the panels are each participant's name, occupation, residence, specific role and length of involvement in the project. The last panel lists the names of an additional 295 individuals and organizations not part of the studio team, who also made significant contributions. While these panels are not included in the Brooklyn Museum installation, they are preserved at the Museum and presented here to recognize the multiple contributions that were made during the creation of this monumental work.